It would be a shame to skip a great opportunity because someone in HR was trying too hard. This is a guest post by Isaac Bullen. Dreaming of a career change? Be careful of what you wish for. Check out these amusingly deceptive job titles along with their actual descriptions, including average pay rates from ehow.com, and companies that were hiring for some of these positions. Description: Transportation specialist. Ok, I remember being derogatorily called this name as a young person. Who knew that with the right training a person could actually grow up to be one? Description: Marketing Executive. Idea + Generation = Ideation? This is why the marketing people should not be left unsupervised for long periods of time. Description: Courier. It’s honest work for those who do not want to be stuck in an office. The dream job tends to sour on bad weather days, however. Description: Garbage Collector. This has to be the most under-appreciated job on the planet. Description: Cleaner/Janitor. Again, this is honest work for those who want a physically active job and the opportunity to snoop around offices after hours. Description: Office Orderly. If you are fortunate enough to have obtained such a cushy position, just be thankful for the moment. With companies downsizing and managers expected to multi-task, the office orderly may be an endangered species. Description: Watchman/Security Guard. As long as wealth distribution officers or thieves as they are so disrespectfully called exist, the good security guard will always remain employed. Description: Financial Services Consultant. According to the “Occupy Wall Street” crowd, the financial services industry may indeed have made someone’s dream come true at the expense of 99% of Americans representing the middle class. Description: Typist. Yes, this occupation still exists usually in the form of a court clerk or data entry analyst. To be competitive in this field, one has to be extremely fast and accurate. I’m talking smoke coming from your fingers fast! Description: Fertilizer collector. This job requires identifying a bat habitat and proceeding to collect the bat’s poop. The bat’s guano is supposed to be a rich source of natural fertilizer. This position was featured on “Dirty Jobs” with Mike Rowe. This is clearly a very nasty career choice and no cool, black “bat mobile” is included. Average Pay Rate: Unknown; pay may vary by bat cave. Description: Cook. This is one of my most esteemed professions. Average Pay Rate: $40,000/year for a specialty food service catering cook. Description: Receptionist. This is the infamous door keeper dreaded by outside sales professionals. Description: House Maid. An even more politically incorrect description would be simply “Mom.” For the record though, the description is officially “housekeeper”. These last 5 positions with funny job names are from companies which were hiring. Description: Dog catcher also known as animal control. Did the lists inspire a career change or a sigh of relieved contentment for your current position? 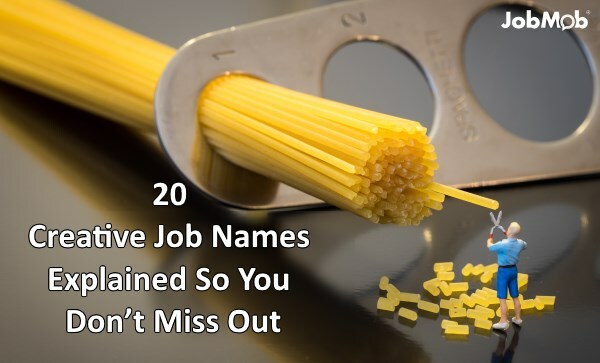 At the very least, you may be tempted to revamp your resume using some of these creative titles. This article was compiled and written by Isaac a blogger who writes for a number of UK businesses including AON Hewitt, a business who specialise in employee benefits and auto enrolment. Isaac spends much of his spare time reading blogs like JobMob and cycling when the weather permits. His LinkedIn profile is available at http://www.linkedin.com/in/ibullen. What’s the strangest job title you’ve ever seen for your own profession? Tell us in the comments. Subscribe to JobMob via RSS or email and follow me on Twitter for a better understanding of your job market. Ideation Specialist was my fave.